Chickpeas, also known as garbanzo beans, among many other names, are a widely popular ingredient in Indian and Middle Eastern cuisine. These legumes are a powerhouse of nutrition and also a source of important health benefits. Chickpeas (Cicer arietinum) are among the earliest cultivated legumes, and have been around for over 8000 years. Native to Western Asia, garbanzo beans were considered a staple in the diet of many ancient civilizations, from the Mesopotamian to the Greeks. Nowadays, chickpeas remain a healthy source of plant-based protein and are highly regarded because of their hefty fiber content. Promoting heart health. Chickpeas have been shown to be of help for lowering cholesterol, which prevents the accumulation of plaque in the arteries and reduces the risk of cardiovascular diseases. Improving digestion. 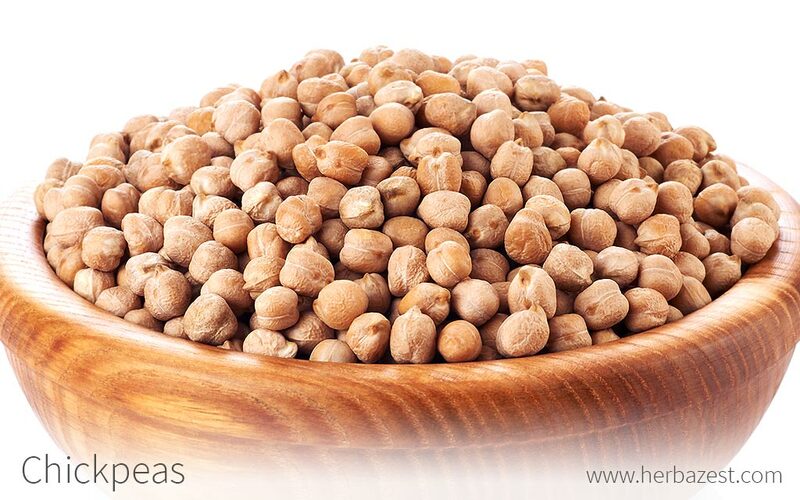 The high amounts of dietary fiber in chickpeas facilitates the digestive process and alleviates constipation by stimulating regular bowel movements. Controlling blood sugar. Garbanzo beans are also known for delaying glucose metabolism, which prevents sugar spikes after meals. These legumes are ideal for people with metabolic diseases and diabetes. The nutrient-rich profile of chickpeas also promotes bone health, and their high content of dietary fiber increases satiety after meals, which makes them a great addition to weight management diets. Chickpeas contain a soluble fiber called raffinose, a type of oligosaccharide that is fermented in the colon by beneficial bacteria called Bifidobacterium. This process creates a short chain fatty acid called butyrate, which plays a role in reducing the symptoms of ulcerative colitis, characterized by inflammation in the walls of the large intestine, promoting regular bowel movements and a healthy colon. The presence of amylose, a resistant starch that digests slowly, makes garbanzo beans helpful to prevent blood sugar spikes by controlling insulin levels, which can improve the conditions of people with metabolic diseases, particularly type 2 diabetes. Furthermore, chickpeas contains a plant sterol called beta-sitosterol, whose structure is similar to cholesterol in the human body. This compound inhibits the absorption of lipids, thus helping lower blood cholesterol levels. 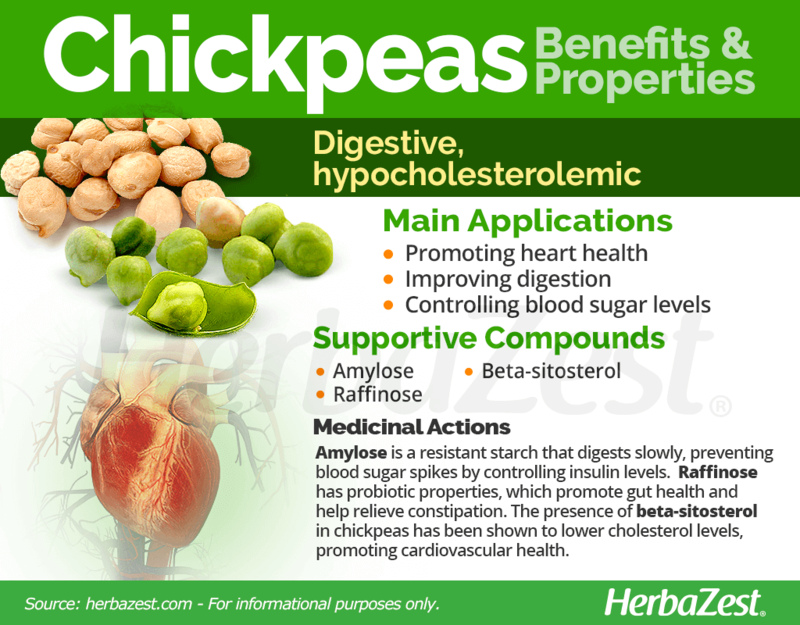 The dietary fiber and healthy fatty acids in chickpeas also help control blood lipid levels. Herbs with cardioprotective and digestive properties are avocados, sacha inchi and olives, whereas goldenberries, lucuma, and yacon also provide hypoglycemic benefits, helping reduce blood sugar levels. Due to their high-fiber content, chickpeas can cause stomach cramps and flatulence. Because chickpeas contain several of the same amino acids as the common bean, peanuts, or soy, those who are allergic to these legumes should exercise caution, since the risk of developing an allergy is high. In spite of being generally harmless for most people, a number of reports on chickpeas toxicity and allergy risks have raised some health concerns. These legumes contain various antinutritional compounds, including protease inhibitors, phytic acid, lectins, oligosaccharides, and some phenols that may inhibit the proper absorption of nutrients. Additionally, excessive consumption of garbanzo beans have shown to enhance allergic problems in sensitive individuals. In order to reduce the amount of phytates and other harmful compounds, its is necessary to soak chickpeas overnight before cooking them. People with Crohn's disease and inflammatory bowel disease (IBD), should avoid most dried legumes, including chickpeas. 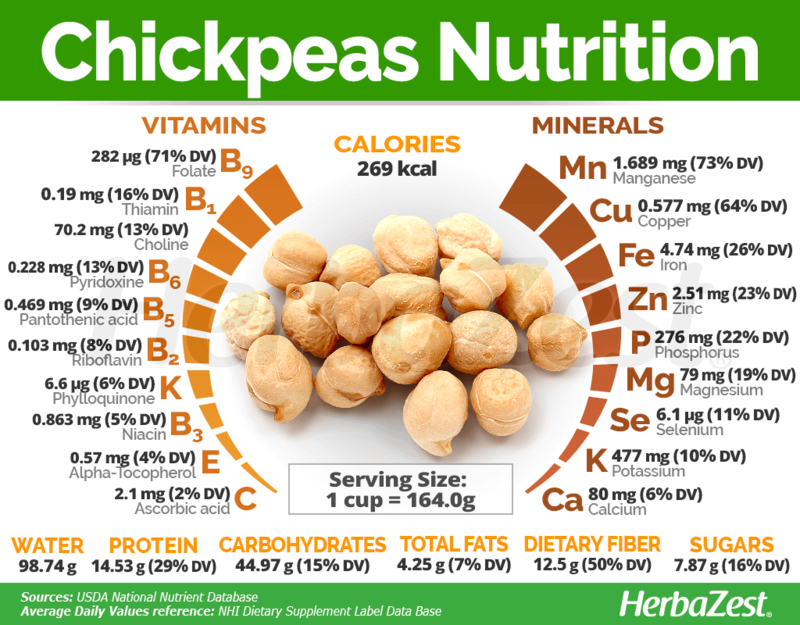 Most health benefits of chickpeas are derived from their impressive nutritional profile. These legumes are an excellent source of plant-based protein; they provide essential amino acids that the human body cannot produce by itself and are necessary for muscle building. These legumes are low in fat, but provide good amounts of good quality carbohydrates, which are used by the body as a source of energy to support vital functions and physical activity. On the other hand, the outstanding amount of dietary fiber in garbanzo beans not only delays glucose metabolism, helping control blood sugar levels, but also improves digestion, promoting regular bowel movements. 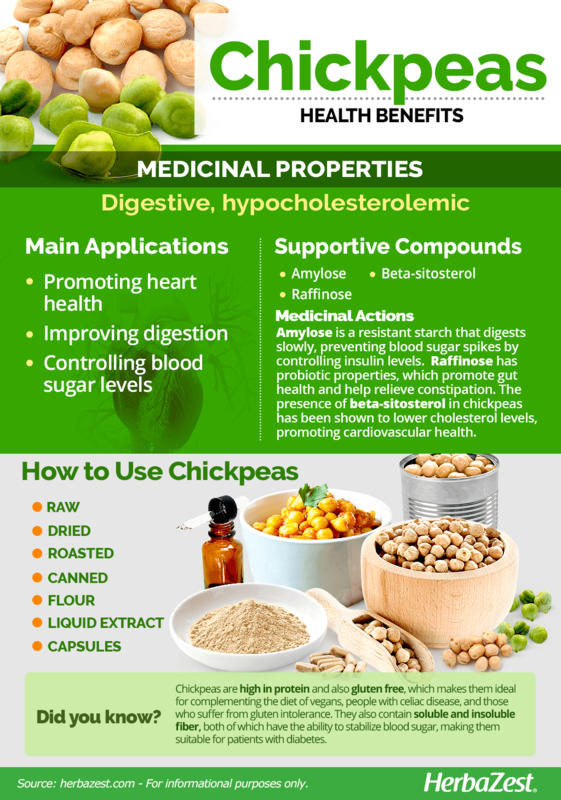 Chickpeas contain soluble and insoluble fiber, both of which have the ability to stabilize blood sugar, making them suitable for patients with diabetes. The amount of minerals and vitamins contained in chickpeas is remarkable, compared with other highly nutritious pulses, like kidney beans. Garbanzo beans provide excellent levels of iron, copper, and manganese, as well as good levels of magnesium, phosphorus, zinc, and selenium, also offering moderate amounts of calcium and potassium. All these minerals are essential for a number of bodily functions, from bones and heart health to red blood cells production and energy metabolism. Chickpeas provide all B-group vitamins, but offer remarkable amounts of B9 (folate), which plays a key role in fetal development, as well as in red blood cells production and iron absorption. Folate also helps lower homocysteine levels - a major factor in preventing heart attacks. Additionally, the presence of moderate amounts of choline contribute with the synthesis of major substances in the body, necessary for cellular metabolism. While their general levels of vitamin K seem to be just average, chickpeas are high in one particular form of this nutrient, called K2 (menaquinone), which has been linked to a reduced risk of atherosclerosis and vascular damage. Vitamin K2 has the ability to inhibit the accumulation of calcium in the arteries, thus preventing calcification and stiffening, which is particularly relevant for women during the menopausal transition. The nutritional value of chickpeas is rounded by small amounts of vitamin C (ascorbic acid) and vitamin E (phylloquinone), which contribute to strength immunity and protect the body from harmful pathogens. A cup of cooked chickpeas (164 g) provides 269 calories, as well as 7%, 15%, and 50% of the recommended daily value for fat, carbohydrates, and dietary fiber, respectively. Chickpeas or garbanzo beans are used mainly for culinary purposes, and this legume is especially popular in Middle Eastern and Indian dishes, such as hummus, falafels, and curries. Also known as chana (in Hindi), Bengal gram, kondakadalai (in Tamil), and Egyptian peas, chickpeas can both be pureed and combined with other ingredients to make all different types of hummus, or they can be eaten whole. In the Western world, many prefer to sprinkle chickpeas on a salad or add them to soups. Roasted chickpeas also make a healthy, suitable snack. Due to its high fiber and protein content, chickpeas are capable of curbing hunger and aiding with digestion, being a great addition to a weight-loss diet. 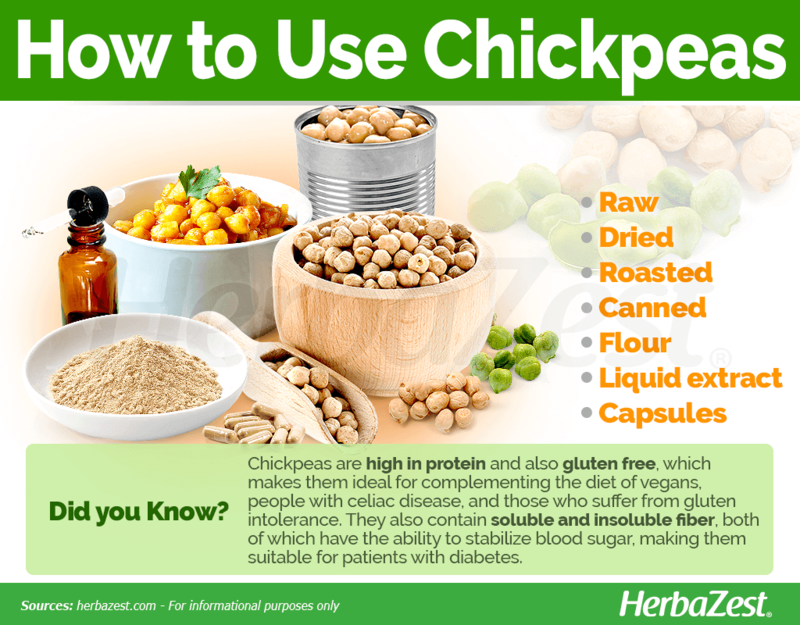 Chickpeas are high in protein and also gluten free, which makes them ideal for complementing the diet of vegans, celiacs, and those who suffer from gluten intolerance. Raw. Fresh chickpeas are green and tender. They cook faster than regular dried garbanzo beans (three to five minutes in boiling water) and there is no need to soak them beforehand. Dried. This is the most ubiquitous form of garbanzo beans. To reap all the beneficial properties of chickpeas it is necessary to soak them overnight, in order to reduce the amount of phytic acid present in the legumes. Afterwards, they need to be drained to be cooked in new water for at least an hour and a half, until tender. Roasted. Widely popular a protein-rich snack, roasted chickpeas are crunchy and delicious, as well as an easy way to reap the health benefits of these nutritious legumes. Canned. Arguably the most popular way of consuming garbanzo beans, since it doesn't require the soaking and cooking procedures necessary to reduce the toxic phytates these legumes contain. Flour. Chickpea flour is obtained from dried Bengal gram or garbanzo beans, and can be used in many culinary preparations, as a thickener or as wheat flour substitute in baked goods. Capsules. The high amount of vitamin K2 (menaquinone) contained in chickpeas is often isolated to be sold in capsule form, and marketed as the best bioavailable form of this fat soluble nutrient. Liquid extract. Obtained from fermented chickpeas, this preparation is meant to be taken by few drops at the time, preferably diluted in water, in order to reap its high amount of vitamin K2, for healthy bones and heart. Chickpeas can be found all year-round in most local markets, supermarkets and grocery stores. While natural, culinary forms are the most widely avaible, there are some supplements based on garbanzo beans. Both dried and canned chickpeas are the most ubiquitous forms of these legumes, and can easily be found in supermarkets, grocery stores, organic food stores, and also online. Green chickpeas, however, are not so common, but can be purchased in some organic food stores and farmers markets. Chickpea flour can be made at home, from dried Bengal gram or garbanzo beans, in a food grinder, and it is also readily available in ethnic markets, specialized in Asian and Middle Eastern products, as well as online. Dietary supplements of vitamin K2, a fat soluble nutrient from the vitamin K family, which is abundant in chickpeas, can be found online, in the form of capsules and liquid extracts, as well as in some local herbal stores or specialized health stores. The chickpea plant (Cicer arietinum), also known as ceci beans, garbanzo beans, and Bengal gram, among other names, depending on the cultivar and geographic area, are really easy to cultivate in a back yard or home garden. However, these legumes require certain conditions to thrive. The following gardening tips will be of help to succeed growing chickpeas. The chickpea plant grows best in warm sunny climates, in neutral, loamy soils with a good drainage system. Garbanzo bean can be propagated from seeds and planted directly on final ground, leaving between 0.8 to 2.2 feet between each plant. In the early stages, chickpeas are often overtaken by weeds, so it is important to use good weed control when growing the plant. Chickpeas take anywhere from 95 - 110 days to reach full maturity. Since chickpeas, just like most other legumes, have the ability to fix nitrogen into the soil, it is not necessary to use nitrogen-rich fertilizers. Chickpeas are susceptible to root rot and caterpillar infestations. The chickpea plant (Cicer arietinum) is a small, annual bush of feathery leaves that stands 8-20 inches (20-50 cm) tall. Each individual seedpod contains two to three peas. White flowers adorn the bush as well. A self-pollinated species, the chickpea plant sits low to the ground, and it does best when planted in warm climates. The chickpea plant belongs to the Fabaceae or bean family, which encompasses approximately 19,400 species spread out over 730 genera. This large botanical group includes many economically-important crops, most notably alfalfa (Medicago sativa), beans (Phaseolus vulgaris), peanut (Arachis hypogaea), peas (Pisum sativum), soy (Glycine max), and tamarind (Tamarindus indica); all characterized by small, compound leaves, and most of them easily recognized by their pod fruits. There are two different types of chickpeas: the kabuli-type and the desi-type. The kabuli-type is twice the size, and has been developed into many other cultivars, such as 'Dwelley', 'Sanford', and 'Sierra'. The desi-type is smaller and more irregular in shape, with a color that ranges anywhere from light tan to black. Many desi-type chickpeas have naturally mutated into varieties of the kabuli-type. The chickpea is one of the oldest legumes cultivated by humans, probably in association with other grains and pulses, such as wheat, barley, lentils, and flax. Archeological evidence of chickpeas' domestication found in Turkey and Syria has been dated to around 8000 BCE. It is though that, by the Bronze Age, the cultivation of chickpeas spread across the Mediterranean region, North Africa, the Middle East, and India, where about two-thirds of the global chickpea production is currently grown. Chickpeas were widely popular among the Ancient Greeks, and they used these legumes for dietary and medicinal purposes, as mentioned by Homer in the Iliad. In the 16th century, the chickpea plant was introduced to the New World by Spanish and Portuguese travelers. During World War I, ground roast chickpeas were used as a substitute for coffee. The world's leading producer of chickpeas is India, with between eight and nine million tons of dry beans produced per year, followed by Australia and Mexico. Although in the United States chickpeas remain a relatively minor crop, domestic consumption has increased, from 0.5 pound to more than one pound (0.45 kg) per person since the early 1980s, and production is slowly growing as well: in the U.S. alone, over 157,000 tons of chickpeas were produced in 2013.